New Forest holiday cottages and other types of self catering accommodation are widely available within the National Park area. Certainly, those seeking self catering cottages will be spoilt for choice in Lyndhurst and Brockenhurst, and will also find cottages to rent in many of the smaller villages and outlying areas. New Forest holiday cottages located close to main roads and in village centres might appeal to visitors who appreciate ease of access and a base close to local pubs, shops and restaurants; whilst those who seek a break something quieter might prefer to be a little more off-the-beaten-track. Holiday cottages offer freedom for guests to come and go much as they please and often provide facilities that particularly appeal to walkers and dog owners. Costs vary, often to reflect location, the facilities available and the time of year, although there is inevitably a certain amount of commonality. Good advice, then, is to undertake at least a little research before booking. Those offering cottage holidays almost invariably provide a welcoming atmosphere, and usually excellent value for money. 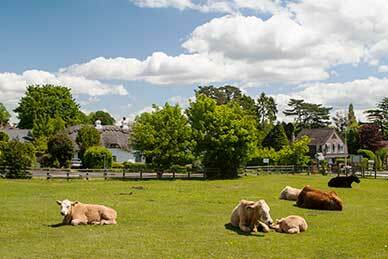 In fact, many New Forest self catering holidays are so popular that visitors return year-after-year. Remember, then, to avoid disappointment by booking well in advance, particularly during the summer months.